33 Freebies to Celebrate 3 Years! I love birthdays! I love goodie bags! And I love that my favorite playground / Spraground in the entire world is turning three years old this month! Three years after, (3 x 365) days filled with overflowing creative passion and tight friendships formed around the world, and here we are! For me, the journey has progressed to courses that I am honored to co-teach with Jes (Type+Writer 1 and Type+Writer 2), a growing chest of digital design work that I am thrilled to be able to sell at the best shop (with the best team of designers and the most awesome Creative Team), and an ever-growing family of the most awesome Spraground fellas ever! Thank you, Jes and Jared, for creating this home for all of us. Thank you, my awesome Spraground family, for being so caring, so amazing, so absolutely awesome! And thank you, YOU who are reading this, for coming to my little blog-porch today and sitting a while. You are awesome. 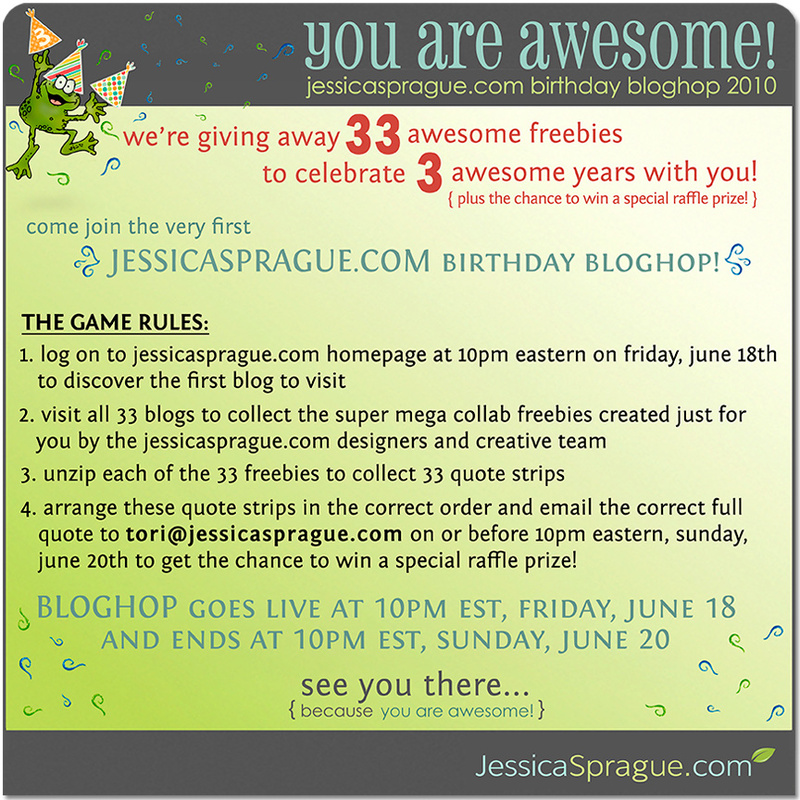 THIRTY-THREE awesome FREEBIES to celebrate three years of jessicasprague.com magic… and to celebrate you, because YOU ARE AWESOME! Here’s how the game goes! See? We love you so much that we decided it wasn’t enough to just give you 33 birthday goodie bags this weekend! There’s more! We’ve included a little quote strip in each of our bloghop freebies (so make sure you unzip those goodies right away! 😉 ). Collect them all as you unzip each freebie from each of our 33 blogs. Then, as you struggle to hold all your goodies in both arms at the end of your bloghoppin’ bonanza, take those 33 quote strips, play around with them, and arrange them in the correct order. When they spell out the quote that reflects our fondest wish for you, type it out in an email… then seal it with a kiss and send it to tori@jessicasprague.com. This AWESOME friend of yours and mine – and an amazing Spraground admin officer who just *loves* support tickets 😉 – will gather all the correctly-arranged quotes and include them in a raffle for some really amazing prizes! 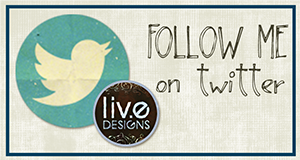 So don’t forget to grab your chance at winning too! (Just make sure you send them in before 10PM Eastern on Sunday! 😉 ). And now, in case you’re shifting weight from left foot to right, thinking “Right. Now let’s get on to the freebie, girl!” … I hear ya! Here’s my goodie bag waiting to jump into your arms! 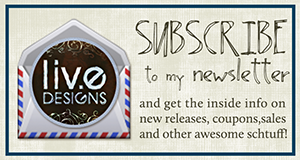 Click on the image to download my part of the mega collab You Are Awesome kit! If you happened to arrive right here on my blog porch first thing this evening, you’ll need to know that you’ve landed at the second blog out of 33. You’ll want to go to the beginning of the bloghop to make sure you didn’t miss a single one of the 33 freebies… so head on over to the Blog of all Blogs that belongs to the Queen of Digi-Skill-Growing and the Diva of Photoshop Fridays and one of my very best friends! Click on the image below to go to Jessica’s Sprague Lab! When you’re done a-grabbin’, hop on over to the next blog, which belongs to… my dear, dear cereal-lovin’ friend and super-talented designer-mate, Nisa Fiin! Now, after you’ve unzipped all the goodies, you’ll probably be dying to start playing with them! Have I got the perfect excuse for you to tear the wrappers off your birthday gifties from us and play with them: come join our challenges, going on at the same time, right on our General Forum area! Click on the image below to get to the Spraground! ETA: If you have difficulty downloading (the download links should work for macs and pc’s alike :D), the likely cause would be kinks from simultaneous multiple downloading, so please try the links again… and remember you have till sunday 10pm EST to grab the freebies! 😀 Thank you soooo much for your patience and for playing with us! Happy Birthday and thank-you for the freebie!!! Just tried downloading….is it disabled? I thought the challenge expired at 10pm (since passed – yes, I missed it), but do all the “blog train” freebies expire, too? I love the colors and admire your work in all the Jessica Sprague classes I’ve taken! Thanks! Thanx so much for sharing your talents! You guys are so great! Thanks for all the fun & prezzies! Yay!! Love it, of course. :>) Thanks for being so awesome (hee, hee)! Thank you. What a great kit! Thanks! Looking forward to playing with this. thanks for you portion of the AWESOME kit!! Thanks for the freebies! This is fun! What a beautiful kit – love the colors thank you! Hi Liv…I can’t believe it’s been 3 years! I remember that very first beta class just like it was yesterday…it was SO MUCH FUN 🙂 Happy Birthday to us! Beautiful and thank you so much for the fun! Love the circle paper! Thank you! 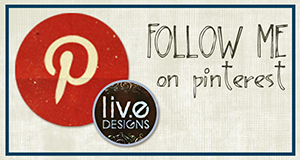 I’m loving this Blog Hop. Great digital kit – I just can’t wait to play all day with my new gifties!!! Thanks a bunch! Thanks so much, is very cute! Hey there! Thanks *so* much for such a great give-away! Looking forward to using it! Thanks heaps! This is fantastic! Thank you! What a great gift!